As I rushed into the kitchen, I discovered that the beans had completely disintegrated into a charred, black mass that was sticking relentlessly to the base of the saucepan. What I didn’t know, when I bought them, was that these little cream-coloured beans with black eyes, unlike other beans, don’t need to be soaked and they cook quite quickly. The traditional Cypriot way of cooking the beans is by boiling them with a bunch of lahana, otherwise known as mangold leaf or chard or beet leaf – it’s confusing, but it’s safe to say they all come from the same family. When the beans and the greenery are cooked, they are dressed with plenty of olive oil and lemon juice. Then you eat them with canned tuna, spring onions and the inevitable chunk of fresh village bread. Put the beans in a large saucepan, cover with cold water and bring to the boil. As soon as they boil, take them off the heat and drain. Put them back in the saucepan, cover with more cold water, and bring to the boil again. Lower the heat and simmer for 20 minutes or until nearly tender (they should still have some bite). Add the spring greens to the pan and boil for a further 5 minutes. When the beans are tender but still whole and the greens are cooked, drain the lot and add a sprinkling of salt, the juice of half a lemon and the olive oil. 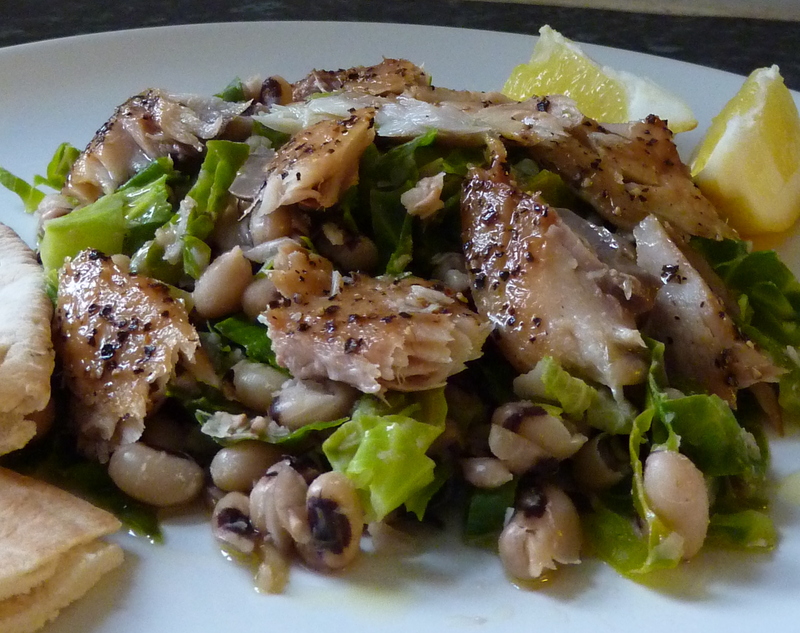 Place a mound of beans and greens on each plate and arrange the mackerel on top. Serve with the remaining lemons cut into quarters and extra olive oil on the side. Eat with warm pitta bread or any other good bread to soak up the oily, lemony juices.